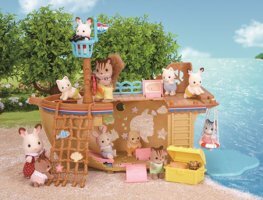 Your Sylvanian babies and children will adore this fun seaside playground. was £17.99; now £9.99 - save £8! Your Sylvanian babies and children will adore this fun seaside playground. The Adventure Treasure Ship has all sorts of clever nooks and crannies for climbing, playing pirates and of course hide & seek! There’s a crow’s nest for breath-taking views across the bay, a swing made out of an old lifebelt and even a chest filled with once-buried treasure!